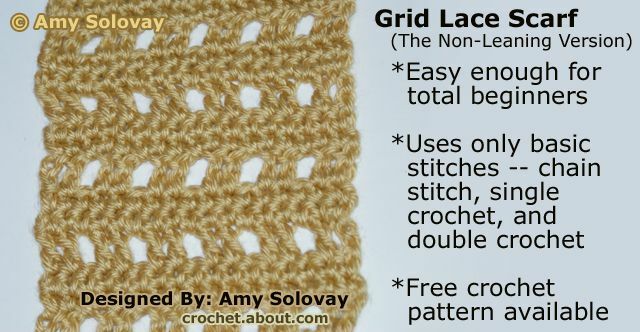 This is the second version of the easy grid lace scarf pattern. This scarf does not lean to one side, but it is a bit heavier and less lacy than the first version. Finished Size: The scarf measures about 4.5 inches wide, and you can make yours as long as you want it to be. The sample scarf shown measures about 48 inches. Row 4: Ch 1, turn. Work this entire row in sc as follows: sc in 1st dc, sc in next dc, [sc in next ch-1 sp, sc in ea of the next 2 dc.] Rep sequence in brackets across the row. Rep rows 2, 3 and 4 over and over until your scarf is the length you want it to be.